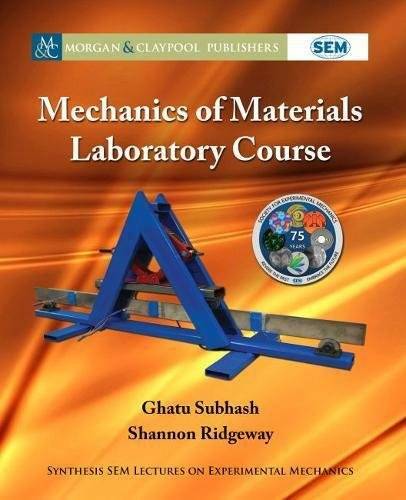 This book is designed to provide lecture notes (theory) and experimental design of major concepts typically taught in most Mechanics of Materials courses in a sophomore- or junior-level Mechanical or Civil Engineering curriculum. Several essential concepts that engineers encounter in practice, such as statistical data treatment, uncertainty analysis, and Monte Carlo simulations, are incorporated into the experiments where applicable, and will become integral to each laboratory assignment. Use of common strain (stress) measurement techniques, such as strain gages, are emphasized. Application of basic electrical circuits, such as Wheatstone bridge for strain measurement, and use of load cells, accelerometers, etc., are employed in experiments. Stress analysis under commonly applied loads such as axial loading (compression and tension), shear loading, flexural loading (cantilever and four-point bending), impact loading, adhesive strength, creep, etc., are covered. LabVIEW software with relevant data acquisition (DAQ) system is used for all experiments. Two final projects each spanning 2‒3 weeks are included: (i) flexural loading with stress intensity factor determination and (ii) dynamic stress wave propagation in a slender rod and determination of the stress‒strain curves at high strain rates. The book provides theoretical concepts that are pertinent to each laboratory experiment and prelab assignment that a student should complete to prepare for the laboratory. Instructions for securing off-the-shelf components to design each experiment and their assembly (with figures) are provided. Calibration procedure is emphasized whenever students assemble components or design experiments. Detailed instructions for conducting experiments and table format for data gathering are provided. Each lab assignment has a set of questions to be answered upon completion of experiment and data analysis. Lecture notes provide detailed instructions on how to use LabVIEW software for data gathering during the experiment and conduct data analysis. Professor Ghatu Subhash is Newton C. Ebaugh Professor of Mechanical and Aerospace Engineering at the University of Florida, Gainesville, FL. He obtained his M.S. and Ph.D. from the University of California San Diego and conducted post-doctoral research at California Institute of Technology, Pasadena, CA. He joined Michigan Technological University in 1993 and then moved to the University of Florida in 2007. He has received numerous honors for excellence in teaching, research, and professional service, including the Frocht Award from Society for Experimental Mechanics (SEM), Best Paper - Journal of Engineering Materials and Technology; Significant Contribution Award American Nuclear Society - Materials Science and Technology Division; Fellow of SEM, Fellow of American Society of Mechanical Engineers (ASME); Technology Innovator Award, University of Florida; ASME Student Section Advisor Award; Society of Automotive Engineers (SAE) Ralph R. Teetor Educational Award; American Society for Engineering Education (ASEE) Outstanding New Mechanics Educator award; A Distinguished Faculty Member by the Michigan Association of Governing Boards of State Universities; and Commendation Letters from the Governor of Michigan. He has served as an Associate Editor for the Journal of the American Ceramic Society, Mechanics of Materials Experimental Mechanics, Journal of Engineering Materials and Technology, and Journal of Dynamic Behavior of Materials. He has graduated 30 Ph.D. students and is currently advising 6 Ph.D. students in various fields related to multiaxial behavior and microstructural characterization of advanced materials, ultrahard ceramics, composites, and bio materials. He has authored more than 250 scientific articles and 3 patents. He has given numerous invited lectures and seminars at various conferences and universities. His invention of fluid-filled energy absorbing cushions has appeared on several TV networks, radio stations (including NPR), and in articles by Reuters, ASEE Morning Bell, and many newspapers. Most recently, he appeared in a PBS documentary "Secrets of Spanish Florida," aired nationwide in December 2017 while discussing the impact response of Coquina, the material with which the oldest fort in the U.S., Castillo de San Marcos, in St. Augustine, Florida was built.